KR222 Access Control Reader using advanced RF receiving circuit design and industrial level embedded micro controller, combined with efficient decoding algorithm,completion of the reception 64bits Read-Only uem4100 compatible ID card, with a high receiver sensitivity, work current small, single DC power supply, low price, high performance characteristics. Built-in buzzer and LED indicator, plain and simple. Easy to install, fully functional, versatile, ideal for access control systems of all sizes. Conform to the Chin standard GB/T17626.4/IEC61000-4-4 standard electrical transient bursts of immunity test (4000V, 5KHZ supreme test parameters). When the card is close to the reader, the red light turns green light flashes once again become a red light, buzzer sounded a loud said to send data, the same ID card, the gap between the two card read less than 500 ms, not sending data. 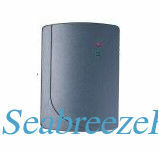 If after reading card, ID, IC rf card is still in the induction zone, card reader will not do any hint, nor to send data. Different ID, IC rf card into the induction zone respectively, reader continuous read rf card and output data. 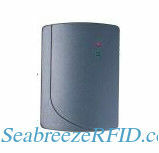 Applications: access control and attendance, charges, anti-theft, Patrol, buildings intercom, car park management system,expressway,e-commerce and other RFID applications.